This post covers, in detail, how to do a front brake job on many Chrysler Corp minivans made from 1996 to 2000. We will replace the rotors and brake pads and perform some maintenance on the caliper pins. This post covers a van with extreme pad wear. The pad wear level at which replacement is recommended is 5/16" (5mm). 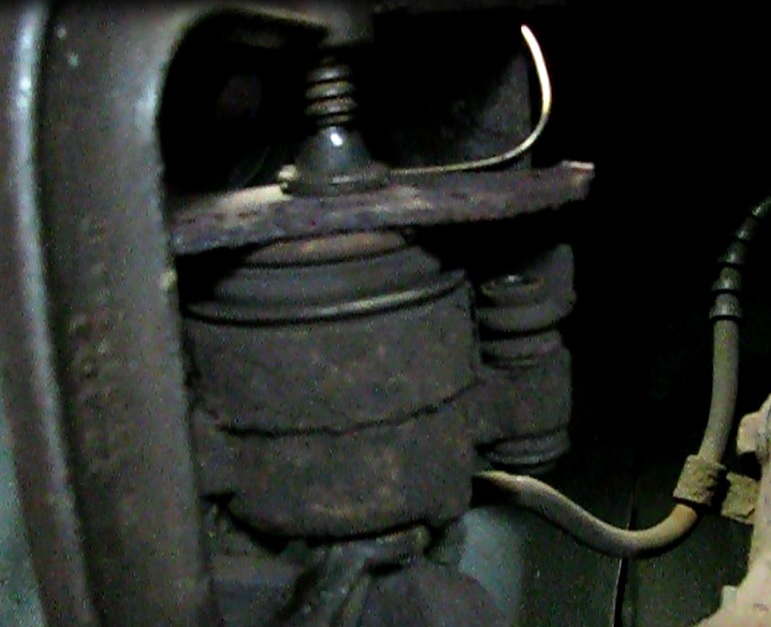 Pulsing felt in the brake pedal indcates that the rotors are unevenly worn and will need turning down or replacement. This job is not difficult for a home mechanic and a good way to save some money and improve the safety of your vehicle. Shown is a 2000 Caravan. Tools: 19 and 10mm sockets, large straight blade screwdriver or pry bar, large (5") C-clamp. Materials: Caliper grease, brake parts cleaner, rags, wire or wood blocks, dust mask. Parts: Set of brake pads and rotors (there are two sizes: one for 14" and one for 15" and larger wheels). 1) Break the lug nuts on the front wheels (19mm), jack up the front and remove the wheels. Set down on jack stands or other supports. 2) Clean the brake calipers and rotors with brake parts cleaner. Wear a dust mask during this part. 3) Remove the two caliper bolts on one side at a time (I started with the driver's side). Note the way the caliper mounts on the steering knuckle to avoid confusion on re-assembly. 4) On the driver's side, use a large screwdriver in the small slot in the top of the caliper and pry down against the rotor. The caliper will kind of hinge downward. Pull it up then and out of the knuckle. 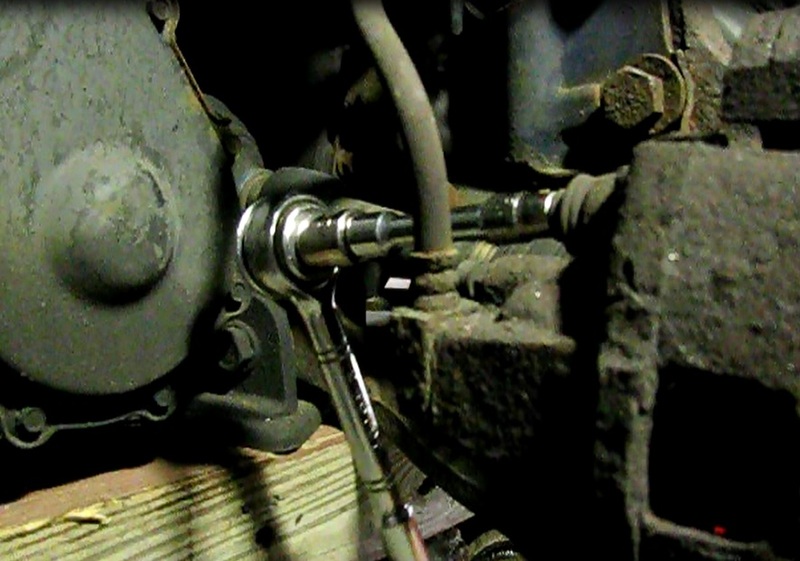 5) Support the caliper, either by hanging it with a wire from the strut spring, or setting it on some wood blocks. Either way, avoid allowing it to hang from the brake hose. 6) Remove the outboard pad. Leave the inboard on for now. 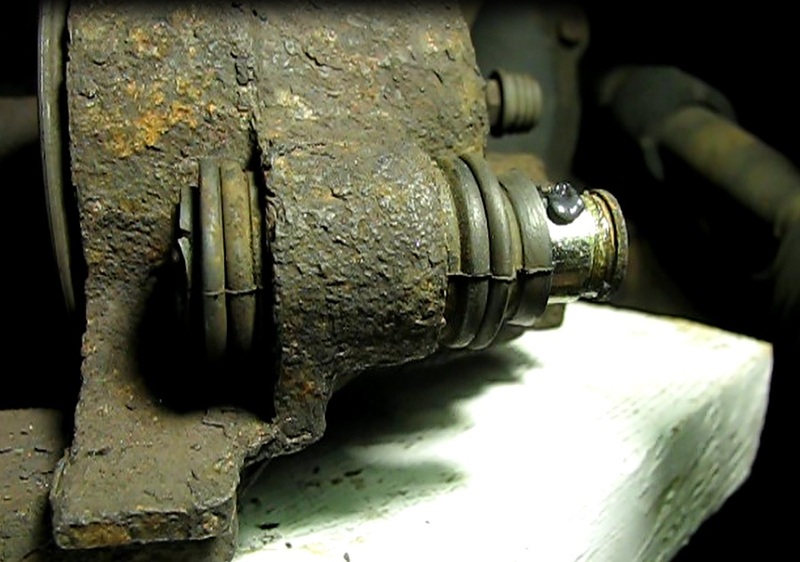 7) Retract the piston. 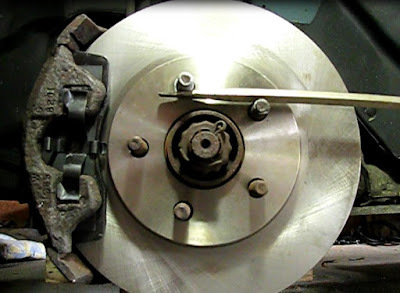 Use the large c-clamp, with one end on the brake pad and the other on the outside of the caliper, to force the piston all the back into it's bore. Then remove the clamp and the old inboard brake pad. 8) Remove the rotor. It may be necessary to tap it loose with a hammer. If so, use a dust mask. Replacement note: There are two different sized rotors that are used on these vans: 14 inch and 15 inch. 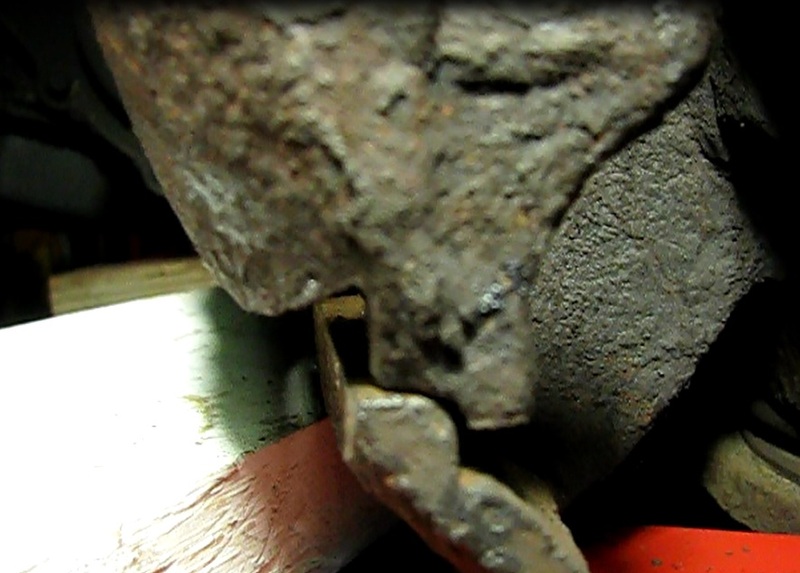 9) Check the caliper pins and boots. The pins should move freely back and forth in their caliper tubes. The boots should be pliant and free of holes or tears. Replace if not in good condition. Even if in good shape, consider pulling the boots back on each end and applying fresh caliper grease to the pins with a cue tip. 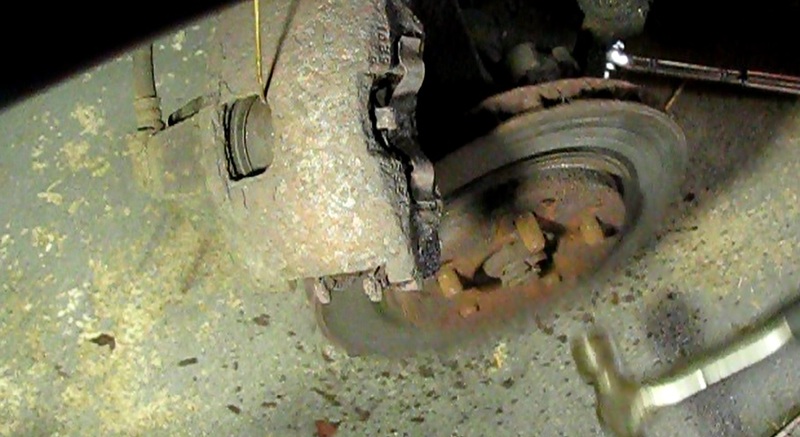 1) Load the caliper with new pads. 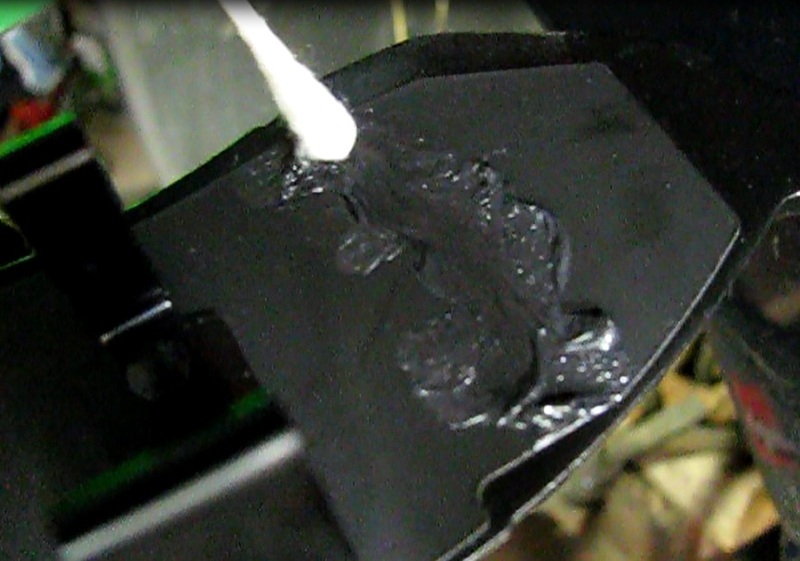 First apply caliper grease or anti-squeal compound to the part of the backing plates on the pads that will contact the face of the piston (inboard side) and the ears of the caliper (outboard side). It doesn't hurt to also apply some to the piston face and the parts of the caliper that will contact the outboard shoe. Snap the two pads into place. These are easier than most! 2) Mount the new or re-ground rotor. But first clean up the surface of the wheel hub with a wire brush and solvent such as lacquer thinner. A little grease on these surfaces isn't a bad idea. You may need to take the rotors off again someday! Holding the rotor in place with one lug nut sometimes is helpful during installation of the caliper. 3) Mount the caliper. If hung up, pull out the wire and seat the lower end of the caliper on the inside of the lower mounting edge of the steering knuckle. Then rotate the top until it seats under the top edge of the knuckle. 4) Bolt the caliper into place with the two 10mm caliper bolts. A bit of fresh grease on the barrel of these bolts won't hurt. Torque to 30 ft lbs. 5) Repeat all steps on the passenger side. 5) Test the brake operation. I like to have a helper apply the brakes as I try to turn the hub with a screwdriver. 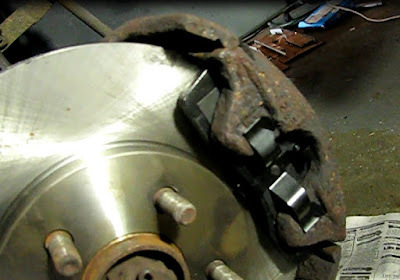 This is also a good way to check caliper release with brakes off. 6) Jack it up and mount the wheels. The passenger side caliper mounts in the opposite way as the driver's side. It will be removed by placing a screwdriver under the lower end and prying upward. On reassembly, seat the upper end of the caliper under the lip of the steering knuckle first and then swivel it downward to rest against the lower edge of the knuckle.